Its ages since I did a blog on setting up syslog for ONTAP, last time was back in November 2013 (and with ONTAP 8.2). Things have changed since then, so time to revisit. The free version is limited to 5 message sources, so we need to add our node management LIF(s). - and add in the IP addresses. 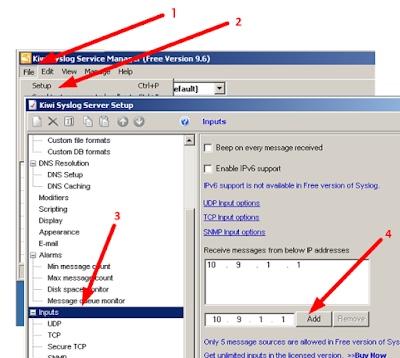 Note: The default setting for Kiwi Syslog Server is to listen on UDP port 514. Note i: 10.0.1.10 is my Kiwi Syslog Server. Note ii: The man page for ‘cluster log-forwarding create’ is an Appendix to this post. Note iii: ‘Command-History.log’ was called Audit.log in the 7-Mode world. For everything else (not totally sure why anyone needs to syslog more than what is in the command-history.log - which includes every SET API call, and failed/successful logins), the commands are slightly changed from those in my 2013 post. event generate -message-name login.auth.loginDenied -values "THIS IS A TEST"
This command is available to cluster administrators at the admin privilege level. The cluster log-forwarding create command creates log forwarding destinations for remote logging. Host name or IPv4 or IPv6 address of the server to forward the logs to. Normally, the cluster log-forwarding create command checks that the destination is reachable via an ICMP ping, and fails if it is not reachable. Setting this value to true bypasses the ping check so that the destination can be configured when it is unreachable. ONTAP 9.1 Syslogging Best Practices?